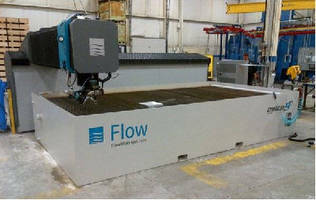 Harvan Engineering Ltd. (Woodstock, Ontario) is proud to announce the addition of a Flow Mach 4 Dynamic WaterJet Cutting System, model 4020b. This new addition expands the plate cutting capabilities of Harvan’s Mazak Space Gear 510 MKII 4000W Laser Cutter (5’ x 10’ Table, 6 axis, Up to 1” Steel or 3/8” Aluminum) allowing cutting of thicknesses up to 24” regardless of the material type. The table is 13’ by 6.5’ offering more elbow room as well. The new waterjet can cut wood, marble, glass, aluminum, steel, paper, textiles, you name it, without getting the product wet! The waterjet expands CNC turning, milling and gear cutting capabilities and will support Harvan’s fabrication and welding operations. Family owned and operated, Harvan Engineering, Ltd. has manufactured quality components for over 25 years. They offer splining, precision cnc machining, welding, 6-axis laser cutting, waterjet cutting and rapid prototyping. The company serves the defence, agriculture and valve industries across North America.